Went to Mission San Diego de Alcala over the weekend for my son's 4th grade Mission project. He elected to do the field trip instead of building a model and I'm glad he did. The Church is beautiful! 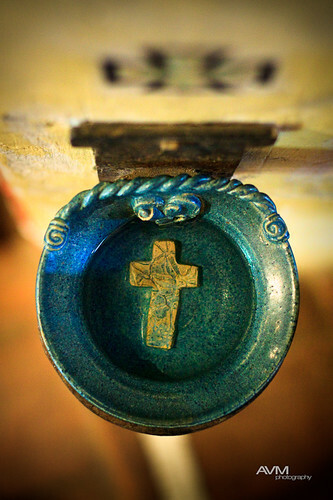 This is a detail of one of the holy water fonts that they had over there. I thought it was pretty cool that they had the cross on the bottom of the font. "San Diego de Alcala, the first of the great California Missions, marks the birthplace of Christianity in the far West. It is California's first church. This remarkable and significant historical shrine provides an understanding and appreciation of the beginning of Catholicism in this corner of the world, so remote from the Mother Country of Spain and yet so similar. "